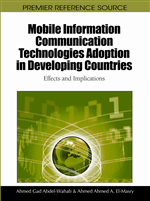 This chapter investigates the influence of mobile phone penetration on economic growth in developing economies. It is widely agreed that telecommunications infrastructure has a positive effect on GDP growth. The empirical evidence concerns mainly fixed line telephony and is mostly conducted with samples from developed countries. Mobile telephony, on the other hand, may be particularly important in those low-income countries, where landlines are not accessible to all. As there also is some evidence that mobile technology may encourage innovative entrepreneurial activity, it is likely that mobile telephony has a great positive impact on welfare especially in developing economies. To examine the role of mobile telephone penetration in economic growth, we use difference and system GMM estimators with a sample of low-income and lower middle-income countries and find mobile telephony to boost economic growth. This result suggests that extensive mobile cellular network coverage facilitates economic development in developing countries. In this chapter, we assess how mobile phone penetration impacts on economic growth in developing economies. Mobile diffusion started later in low-income than high-income countries, but after that the growth of the penetration rate has been rapid. The diffusion is accelerated by the fact that it is cheaper and faster to build mobile infrastructure than fixed lines. Moreover, as penetration has already reached nearly 100 percent in high-income countries, future growth of mobile telephony will concentrate in developing economies (Donner, 2008). It is widely agreed that telecommunications infrastructure has a positive effect on GDP growth because it lowers search and transaction costs, improves the quality of information and accelerates the diffusion of knowledge. Thus, mobile telephony should play a similar role in economic development. As the impact of mobile diffusion on access to communication services might be at its largest if fixed lines are lacking (ITU, 2003), mobile telephony may be particularly important in those low-income countries, where landlines are not available to all. There is already some evidence that the adoption of this innovation has increased the efficiency of small business activity, and generated new kinds of businesses (Frempong, 2009; Hahn and Kibora, 2008; Donner, 2007). A problematic aspect from the point of view of this study is, however, that the official GDP figures are unlikely to capture the impact of mobile telephony entirely. Particularly the earlier literature on the relationship between telecommunications and economic growth uses the number of mainlines as a proxy for telecommunications infrastructure, while some studies use other measures such as the annual share of real GDP devoted to telecommunications industry (Röller and Waverman, 2001; Madden and Savage, 2000). Due to data availability, the bulk of the research concentrates on OECD countries. Nowadays, data on mobile telephony are also available even for developing economies, but the topic of mobile phone penetration and economic growth in less developed countries has received only limited attention. Moreover, many studies use cross-sectional data even if the use of panel data would make it possible to take country-specific fixed effects into account. Another shortcoming in the existing literature is that some of the studies treat telecommunications infrastructure or mobile telephony as an exogenous regressor or falsely conclude that endogeneity does not diminish the reliability of the results in question. In this chapter, we aim to fill some of these gaps by focusing on low-income and lower-middle incomecountries. Furthermore, we use panel data and methodology that accounts for endogeneity. The chapter starts with a literature review followed by a methodology section also including estimation results. The chapter ends with directions for future research and conclusions.